Koh Phi Phi offers great diving opportunities. 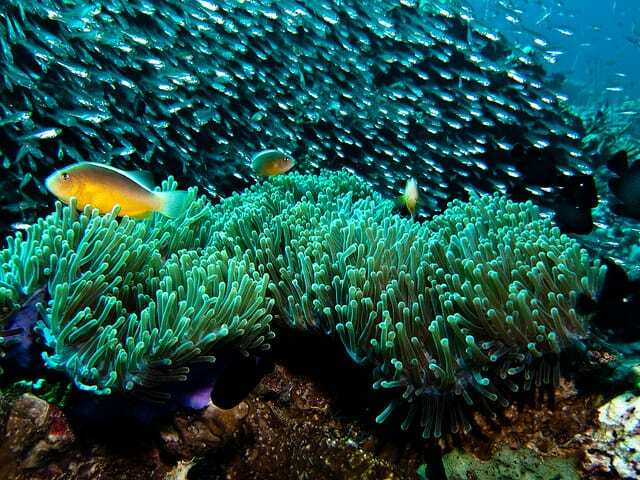 It is a good base to explore the best diving sites of the Andaman Sea. Moreover diving is quite cheap and it is a good place to take diving lessons and pass your Padi Open water. In this page you will find more detailed information about scuba diving in Koh Phi Phi. How to dive Koh Phi Phi ? More experienced divers will prefer to go diving further on a day trip. They can for example go to Hin Daeng and Hin Muang dive sites. They are both listed among the best dive spots in Thailand and in the world. Hin Daeng is famous for its fantastic marine life on a steep wall and Hin Muang for the superb violet coral. Both sites are among the best places in the world for Whale Shark sightings You can expect to spot grey reef sharks, leopard sharks and large schools of pelagic! There is also good wreck diving with the King Cruiser wreck to explore. This spot can be combined in a day trip with the two other excellent dive sites of Anemone Reef and Shark Point. Maya Bay on Phi Phi Le island is also a very good spot for experienced divers with beautiful soft coral and teeming marine life! Most of the dives are steep walls with many cracks. There are also numerous small caverns to explore and even caves but this is only for very experienced divers. You will spot turtles, blacktip and Whitetip reef sharks. Leopard sharks are common too. Macro lovers will also be delighted with many seahorses and various species of pipefish with great opportunities for underwater photography. How to dive Koh Phi Phi? You will find many dive centres around Ton Sai bay. Always visit several places and ask questions before choosing as they don’t all the same standards. Prices are regulated and about the same standard price in all of the dive shops. I usually use this website to book in advance my hotels in Koh Phi Phi, Thailand as they usually have the lowest rates I find. I like it because it's free to cancel and change the dates. The wet season runs from May to December. From June to October, there is heavy rainfall and about. Activity on the island is greatly reduced. Water visibility is reduced but it is still possible to dive. The dry and hot season runs from January to April and is the best time to visit PhiPhi. The air temperature ranges from 25 °C to 32 °C and water temperature is about 29 °C all year round. It is possible to dive all year round. However, the best diving time is from February to May when the visibility is very good. Liveaboards are running all year round. Diving conditions in the Phi Phi Marine Park are mostly good but depend a lot on the season. Visibility ranges from 10m to 20m and can be reduced after heavy rains. Current is usually gentle and most of the dives are quite easy. Snorkelling around Koh Phi Phi is very good. Snorkelling day trips can be easily arranged. It will take you to the best spots around the islands. It is a very good way to explore hidden places. If you are planning an upcoming dive trip or travelling to Koh Phi Phi, it is a really good idea to invest in travel insurance for scuba diving, because you never know what could happen and when you might need it (because accidents do happen!). I recommend this diving insurance as they offer worldwide coverage and focus on providing scuba divers a quality insurance and medical assistance service. Now that you know all about the underwater world, you might want to start planning your scuba holiday! Check out our Koh Phi Phi Travel Review for information about how to get there, activities and excursions, where to stay, and more. 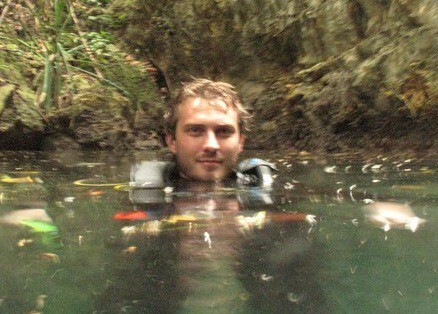 We are going on holiday to Thailand in September and want to do some diving. 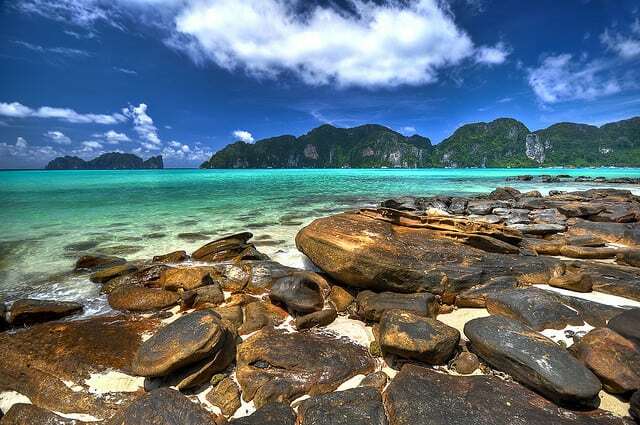 We are not sure whether to go to Koh Phi Phi or Koh Tao – which would you recommend please? see the chart, i think Koh Tao is the best during Sept.
I’ve been diving in Phi Phi and Tao and would 100% recommend Phi Phi if you’d like to see marine life instead of divers. In Tao unless you go to Chumpon or Sail Rock, you won’t get anything as near as what Koh Bida Nok, Koh Bida Nai, Hin Bida, Garang Haeng, Malong, or Chong Lu will offer you in Phi Phi Marine Park. I’d recommend Princess Divers in Phi Phi. Top noch service. one of the best dives ever. We went to maya bay through a tunnel full of fish, saw reef sharks not only while diving, but also during snorkeling, skorpion fish, eels, and so on. Oh, and we dived in August 2012, but had perfect weather (despite the fact that this month is not considered ideal). Can anyone recommend a dive charter that they enjoyed their experience with? We will be renting most of the gear and have a range of newbies to intermediate experienced divers in our group. Koh PP is super crowded and wet sewage flows out to sea. The largest island of the two can’t support the high quantities of people that visit and stay on the island. Has anybody ever gotten sick from diving here? I went snorkeling around the smaller Island and it wasn’t that great. Visibility was less than a meter from all the people in the water and all the boats and everything. Thank you for your review, if though it ain’t a positive one, it certainly reflects the sad reality. The situation of some dive sites in Thailand is super sad, and of course it’s very crowded. Thank you. These forums are a very powerful communication tool and for there to just be all positive comments is really a abuse of unbiased information. I wouldn’t say that I’m speaking negatively, I am bringing uncensored realities to divers about locations to spread awareness about the reality of what’s happening to our world. And as divers, all of us should be reducing, if not eliminating, single-use Plastics from our lives because everything ends up in the ocean no matter where you live. Trash and waste management is like politics, it’s really scary stuff because there’s no quick Solutions and people want quick Solutions and to know the beautiful dive areas to go diving in but without having to do their part as a citizen of this world. We can share our secret travel spots but that is just going to result in destruction of coral and pollution as more more people get out to those spots. It’s much better in my opinion to spread awareness about the shocking truth of how polluted this world is so that we can all come together and find a solution and just get it done so we don’t have to hunt around for beautiful dive spots. What do you think? Sorry, I feel like I’ve expressed myself wrongly. I did not meant to emphasize that the comment wasn’t “positive” but more that I was saying thank you for sharing even if I feel sorry you’ve had a bad experience. That’s also why I did not use the word “negative”. As for “hunting little paradises”… I just love doing that, it’s my way to have a little part of the world and I would even say it goes along with meeting great minded people that visit those remote spots and care for their environment. Also, I would like to emphasize that this and raising awareness is, in my opinion, not mutually exclusive, and more like the opposite. Again, sorry for the confusion and THANK YOU For reading DiveZone & Sharing your thoughts! Ok. haha. Thank you for explaining. As for special spots, I recommend Pattani area. It’s remote and there’s a bit of a current, but its some GREAT diving. Went to Koh Phi Phi, May 2018 for diving 3 Days (Padi Open Courses) and it was just handsome! One journey of Diving and had a good time with the SSS Phuket Crew which are very professional and young guys who want to give us smile all the day ! I’ve seen Mantay Ray, See Turtles, corals … Cannot forgot this cool time because the visibility was perfect ! Have you been diving or snorkelling in Koh Phi Phi? Consider sharing your experience with the diving community by leaving a comment below! Planning holidays in Koh Phi Phi? Looking for practical information for a trip to Koh Phi Phi? Check out our Koh Phi Phi Travel Review! Check out these few spots around Koh Phi Phi!